The Japanese-style painting of today results from the group of Eastern paintings and its character was polished with time in contact with our culture of which it forms part now. The Westerners have often a limited vision of this painting, in black and white exclusively.  Whereas there exists about it of many kinds where the colors dominate. By respecting the tradition, I try to innovate it energetically and I wish that you will feel my attempt. "Japanese-style painting" is the pictures using traditional skill and material of Japan.What mainly ground a natural minerals is used as paints, and glue is used as adhesives.Mineral colors are grind or heat to change the tone of their natural color.Metal foil, powder, shell powder, soil, others are used.It's paint on various things, such as Japanese paper (very long and strong fiber) , silk, board and others. Prior to the introduction of IWAENOGU, the materials used are made from natural ores. There are a number of different grades of powder, which vary in coarseness, from that of very fine sand to clay. Iwaenogu materials are sold commercially in Japan. The finest of these is known as BYAKU(whitish). There are many other types - almost too many to count. 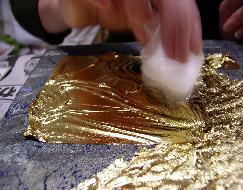 The powders are mixed with glue before use. These materials are also called GANSAI, rock-paint natural pigments. 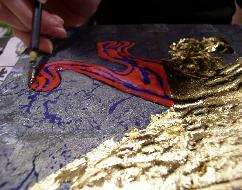 The DEI is used to give the metallic aspect of gold, silver or platium. The very thin foils of pressed metal. That is in the market by 10 to 13cm square. For example: Pure gold, platinum, silver, copper or aluminum. 2 or 3 drops of oil on a newspaper fold in four. Presser with a tow to spread the oil. Put a thin paper on the newspaper and to let it moisten the oil. 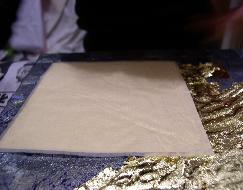 Transfer this paper on the HAKU with a pincette of bamboo. Then put a little NIKAWA with a brush on the painting support. Take the paper and the HAKU, and to put then with precision without making bubble, well positioned, to withdraw the lubricated paper finely. 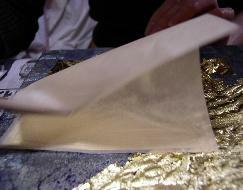 To give a decorative aspect to the HAKU, we press it on a sifter that lets escape of the irregular grains.